Every year, since 1929, the Academy Awards recognises cinematic achievements in Hollywood. They have recognised stars such as Meryl Streep, Audrey Hepburn, Sidney Poitier and Tom Hanks. The 2018 Academy Awards was no different; delivering glitz, glamour and the celebration of the best in film. What has any of this to do with higher education, I hear you ask! Well, nothing really but it did put us in the mood to celebrate the best of higher education film. 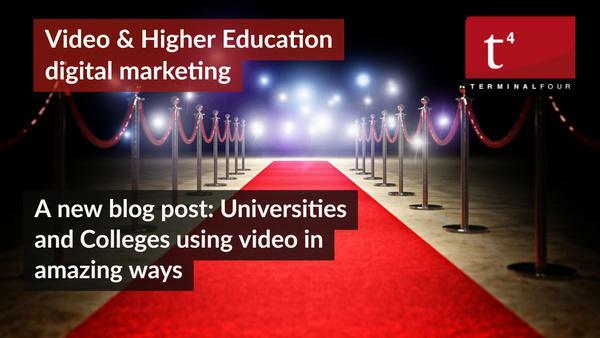 Video is such a powerful medium through which universities can reach current and prospective students. We know anytime the subject of video comes up around social media managers, it's essentially lauded as the greatest thing since Twitter doubled its characters. Storytelling has become such an important part of marketing and video allows universities to tell their story quickly while reaching a very large online audience. With this in mind, we thought we would round up some of our favorite ever higher education recruitment videos. This powerful video from Western Sydney University tells the story of Deng Adut; taken from his mother at the age of six, forced to fight with the rebels in Ethiopia, rescued by the UN where he overcame many obstacles to study law. This Auburn University commercial features Apple CEO, Tim Cook and other notable Auburn alumni. The purpose of the video is to show students the possibilities of where an Auburn education can take them. It's 30 seconds long and has been viewed almost 50,000 times. To say we love this video from Oxford is an understatement. It's filled with delightful morsels about life at Oxford University for international students. For instance, did you know that Oxford has a cat society and a tiddlywinks society? There really is something for everyone. 64% of students at Oxford are international and this video sells it so well! This animated video from the University of Phoenix has been viewed over 11 million times and it's easy see why. It tells the story of a single mom who goes back to university after her manufacturing job becomes automated. It's beautifully animated, masterfully told and the music is perfection! Watch it and prepare to be moved. What do you think of our Higher Education Oscar choices? Do you agree? Send your top higher education video moments!